I am a homeschooling mother of 3 amazing kids and also a writer, hoping to publish a book in the near future. I am married to an awesome man who has supported my vision to homeschool and raise our kids against the grain of the world. I am an advocate of excellent coffee (freshly ground beans daily!) and a sweet homemade treat daily. I am a city girl living a country life that just sort of happened. We live in a small town in Northern, British Columbia, Canada. Some day I hope to retire in a condo in downtown, Vancouver! For now, I am truly blessed to live on 4 acres, with a horse, 2 dogs, a bunny, a cat and a huge garden. My kids have space to create, roam around on dirtbikes, ATV’s, and horses. They have the freedom to explore, build, and grow. They know they are how good they have it! I am truly thankful to God as without Him, my life would not be this life. Welcome, Loretta! Tell us about your upbringing and early memories. I was raised in Kitchener, Ontario by two loving parents. I was brought up Roman Catholic and went to an all-girl Catholic high school. Being the oldest of 4 children, I have one sister and two brothers, all who still reside in Ontario. My siblings and I remain close despite the distance (as I now live in British Columbia). Some of my earliest memories include happy times of going to my Grandparent’s home on Sundays and sitting at their kitchen table, drawing and writing stories while the adults played cards. We would entertain ourselves for hours with only a pencil and scrap paper! Growing up Roman Catholic, I had a basic understanding of God and Jesus. I went to mass weekly and had to take religion class in school from Kindergarten to Grade 12. Even though I would pray to God, I never understood that the necessary step to knowing God was having a personal relationship with His son, Jesus Christ. I realized my need for a savior when I was 32 years old. After trying most things the world had to offer and struggling with addiction for many years, I met a young man in my Alcoholics Anonymous meeting who was a Christian. He was blonde and looked angelic, but he was actually an ex-santanist (and also a pastor’s son!). I was drawn to the light of Jesus in him and asked him all sorts of questions about Christianity. He told me to just read the book of John, and he gave me his bible.I accepted the Lord on my own reading the bible. I met another friend in AA, a young woman who was also a Christian. She had many tattoos and was an ex-prostitute, not practicing however still living on Hastings street in Vancouver. These two people were influential in the beginning of my journey with Jesus. Although I have completely lost touch with them, I will always be grateful to how willing they were to share their faith with me. I’ve always enjoyed writing stories as a child and would enter all sorts of writing contests. Creative writing and English were always my favourite subjects in school. I have kept a diary for as long as I can remember. My adult version of my diary is now a prayer journal. My definition of a successful writer is not by the world’s standards. 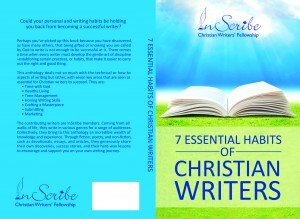 I would define a successful writer as one who communes with God through their pen and writes to become closer to God. I believe that all of our talents are from God and ultimately we are to use them for Him. For example, I also dance, however, I have never danced for the world. God has given me the gift of dance and when I dance for the Lord I feel closer to him and have been told my dance draws others deeper into worship. This would be the same for me as a writer. If my words impact others to ultimately glorify God then I am a successful writer. I like to start my day by asking God for direction and writing in my prayer journal. It is a way I talk to God, and it unloads my heart so I can focus on other things; writing included. Set yourself a doable amount of time to write every day. That varies for me with the season of the year as well as the season of my life. I find it best to do this before I check my emails or social media as that way I avoid time-sucking rabbit trails. At the moment I am looking to publish my children’s picture book called, “Mommy, Why Don’t You Drink Beer?” It is a light-hearted conversation between a six year old boy and his mother about addiction and sobriety. I am also writing a novel about a woman’s journey with addiction and relationships, searching to fill that hole in her heart that only Jesus can fill. I also have a parenting book peculating in my mind but at the moment that is a testimony in the making. Being a Christian gives purpose to everything I do. Being a wife and mother, a daughter, a sister, a writer, an employee…..I can’t imagine doing any of these things without God at the center. It is hard for me to believe that I lived 32 years without the strength of Jesus by my side! You know, I honestly never think about that. I guess I think about what would be said at my celebration of life and I would like the words spoken to say that I was a loving mother, wife, daughter, sister and friend. What a great interview. I learned some new things about Loretta and feel I know her just a bit better. Looking forward to seeing both of you at conference. I learned a lot about Loretta too 🙂 I’m looking forward to seeing both of you next week!